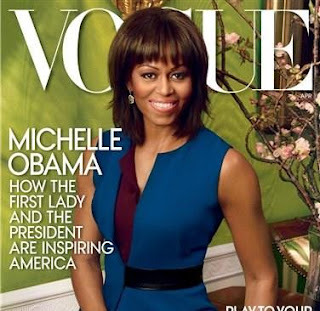 Michelle Obama: The First Lady, Second Vogue Cover! Michelle Obama will be on the April cover of Vogue that hits stands March 26th! This will be the second time First Lady Michelle Obama has graced the cover and I understand that she will be covering some important key points regarding Obama Family life. Michelle O goes into specifics about the First Couple's priority of parenting and that despite their presidential responsibilities every chance they get they are catching up with their daughters. Just from an overview of the article that I've read, I think that this write up will be insightful and a delight to read. So if you get a chance pick it up and don't forget to look at the fashions that Mrs. O will be wearing.